Meal times, especially dinner, can be a stressful experience for families. It’s typically a time when everyone is rushing around and feeling tired after a busy day at work or school. There might not be much time between picking the kids up from after school care and getting dinner on the table and it’s normal to be feeling flustered about it. There are a few ways you can turn meal times into fun times though. 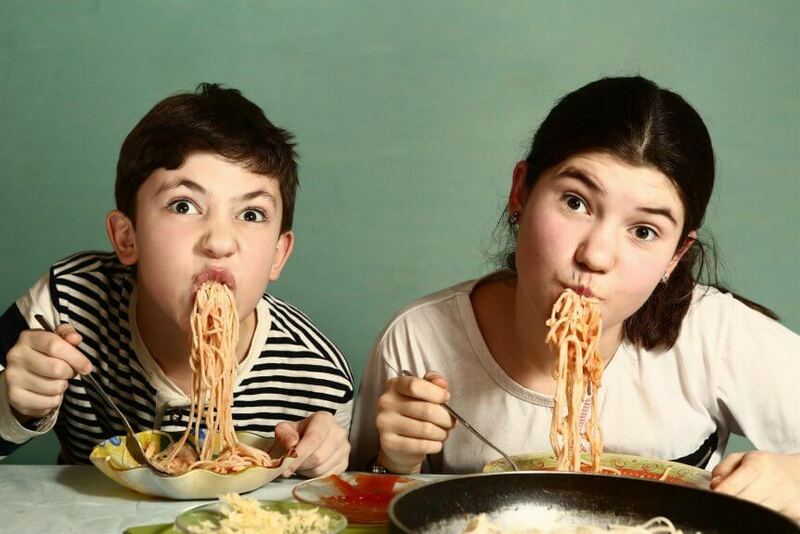 Read on to find out how you can relieve some of the pressure at family meal times. It’s not always possible but when it is, eating together as a family is a powerful way to connect with your children. It can take some of the stress out of the meal as you take the time to sit and enjoy your meal and time together. Talk about your day, debrief and enjoy each other’s company. It might seem like an impossible task, but it can make a great deal of difference to your day and your meal times if you can manage it. Worrying about fussy eating adds to the turmoil of meal times. Putting pressure on kids to eat everything on their plates, or to eat vegetables they don’t like can really make for an unpleasant meal experience. Practice the Division of Responsibility in Feeding. This means you decide what your child will eat and when, and your child decides if they will eat and how much. It’s a simple practice that can really make a difference to how kids view meal times. Still provide all the same foods, just take away the pressure surrounding it and see what happens. You don’t need to cook glamorous meals for them to be healthy. If meal times are causing you stress, make sure you plan quick and easy meals. Utilise your slow cooker or batch cook on the weekend and portion meals into the freezer. It’s always tempting to quickly check email or social media at the dinner table, but it can have a negative impact on your family’s meal experience. Make a blanket rule that there are to be no devices at the dinner table – adults included – and switch off the TV so you can all concentrate on the simple task of eating. It’ll also encourage some discussion if there are no screens to distract everyone. Meal times can be stressful, but they don’t have to be. Eat together as a family, don’t pressure children to eat and switch off screens and see if it reduces some of the turmoil of dinner time.